‘Ever hear that expression “the difficult 2nd album”? This was a bit like that! – especially after going to the Dublin Comic Con the other week and seeing that there are LOTS of Irish comic creators, doing terrific work. Much more than I expected! As you may know, the « 20th strip went up here many weeks ago and I took some time to review the work so far and think about what works and what doesn’t, what are the strengths to focus on and make even better. I wrote a blog article about drawing faces for the comic that you may find of interest. My wife Gabby suggested that the original punchline might have been a bit obscure. There was also a bit of a prob with one of the word balloons. Take a look for yourself. I met Paul Bolger again, at the Con, after about 20 years away from the animation biz, and was astonished to see what he’s doing now. 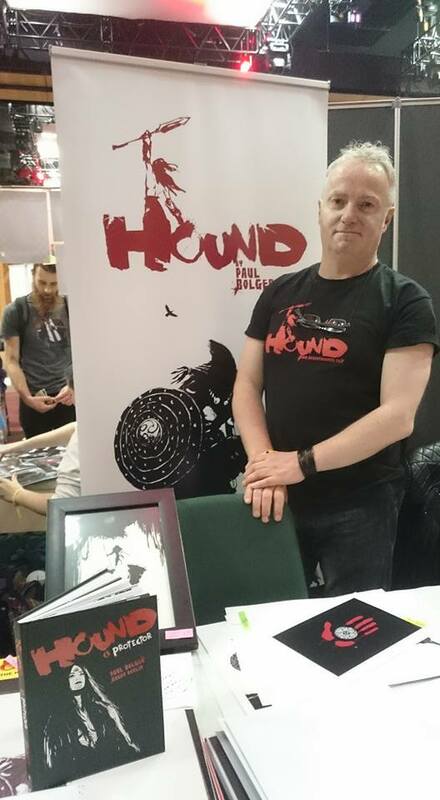 His second graphic novel is coming out soon, following the success of his excellent ‘The Hound’ and he’s running a Kickstarter Campaign for it. Check it out! Irish Celtic Folklore/Mythology. There were probably a lot more children of soldiers living around me than I realised during the 1970s. In Scotland for example, there were council-type houses up at the bend in the road beside the forest, where ‘The Army Kids‘ lived. When we moved to Ireland in 1977, there was the Curragh Camp near Kildare town and The Barracks in Naas town, not far from where I’d later go to see Star Wars – and go to secondary school. The dad of one of my best friends, John S was in the army – and so was his uncle! Not only that, but old Mister Mick McDonald who lived two doors away was a British army tank commander in WW2. I worshiped him! One of my other pals said to me one day, after we rang his bell and waited for the door to open, “Now John, don’t ask Mick all about the war and things. He probably doesn’t like to talk about it.” It didn’t stop me, and he didn’t seem to mind. On the contrary, he seemed to enjoy regaling me with the stories, and lending me war-related books. He and his wife lived in a small 1-storey cottage, but one large empty looking room had a bookcase all along one wall which was packed with goodies. I even made a WW2 board war game on a large sheet of paper once and brought it around to him, and he played it with me! Which was great of him, because it was probably quite boring! I think I still have it around here somewhere. He was such a nice jolly old gent. Him and his wife were so loveable. I’ve tried to keep my commentary short this week (and failed). I got into the habit of writing accompanying articles with the comic pages on my Star Wars age 9 and Alien age 11 webcomics – and people really enjoyed them. What do think? Should I keep doing it here? Or are you really here to read comics? I also want to leave space – as it were – for you to give your own thoughts. I had the opposite experience with most of the (combat) veterans I knew. Both my Great Uncle and my best friends father served as infantrymen and were in the Bulge (Ardennes). Neither was interested at all in speaking about it or encouraging interest. The absolute most I ever learned was from Mr. Reid. He kept a large piece of shrapnel displayed. We asked him about it once and he told us it was from a German AT gun that got destroyed. The piece had nearly taken his head off, so he kept it after it cooled in the snow. That was it, he never said anything else about the war again. Both grandfathers served, But one predeceased my parents meeting and the other had plenty of mundane, but interesting stories (they got more interesting as I matured). Another Uncle served in Vietnam and didn’t really open up until I was in my 30’s. That said, I’ve also known several talkative types. I knew a Chosin survivor who, once you started him off, it seemed he couldn’t stop talking until he’d told it all. My dad says, when he was a lad, he would try to get his own dad to talk about his time serving in WW1 – especially during walks through the parks in Liverpool. But grandad Jack never wanted to. He saw some terrible, horrible things. I like the original punchline, John. 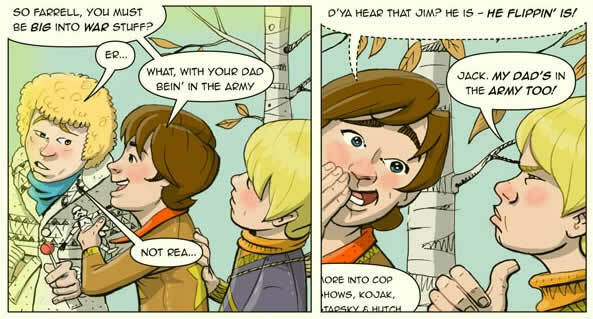 It suggests Jim has hidden depths. But perhaps Gabby was right that it might be a bit obscure. I suppose it also might seem a bit beyond the characters’ years, although I think that’s a gift you have to grant them occasionally. Good to have B*W back, John, and on great form. I love the fact that the wraparound sweater, lollipop and “Who loves ya baby?” seem to be working for Farrell! There’s a lot crammed into this strip, in terms of having two or three conversations intersecting, but it works really well. The text was a big part of what made Star Wars Age 9 work. I suppose it’s not as vital to B*W, but it does make the experience more satisfying – like a comic book that has a second story, or editorial features, as well as the main story. I’ll admit I sometimes feel I skimp on examining the art and have to go back and look at it again to do it justice when I’ve read everything, but I think that may just be the way I process things. Thanks Darren – high praise. And those are really interesting points. I was telling my dad yesterday that I think with this type of strip, you’ll tend to re-read it to take everything in – or at least I hope people will. So: get the narrative ‘gist’, the main humorous thrust, and enjoy the pictures on the first read-through; then re-read and spot and ‘get’ a few other things. Some of what I do with speech balloons and overlapping dialogue might be a bit challenging sometimes, but I hope that it encourages a second pass for a more rewarding read. Which reminds me, I must publish some more of those pages. The site is only half re-published sine the hacking.